For some snorers, even the highly popular and effective Rhynil Stop Snoring Spray does not help with their problem, or they find that the effects do not last long enough. With Rhynil Double Strength Stop Snoring Spray, even heavy snorers (and their loved ones) can enjoy a good night's sleep! How Does Rhynil Double Strength Stop Snoring Spray Work? Rhynil Stop Snoring Spray features Euphrasia Officinalis (commonly known as Eyebright), which is a naturally astringent herb. 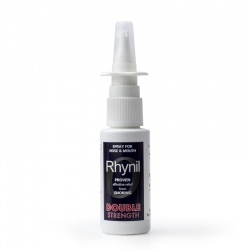 By applying the spray to both the nose and the roof of the mouth, Rhynil can help to reduce "palatal flutter", which is one of the main causes of snoring. Rhynil is very useful in countering infectious conditions in the sinuses and nasal passages. Extremely effective in reducing catarrh, Rhynil Spray has other unique properties that can treat inflammatory conditions such as allergic rhinitis. Common household items such as feather pillows, house dust mites, pet hair, perfumes, cosmetics, fabric softeners, air fresheners and insect sprays are all known to cause allergic rhinitis. The anti-inflammatory properties of Rhynil reduce the inflammation in the nasal airway and improve nasal breathing. Is Rhynil Double Strength Right for Me? 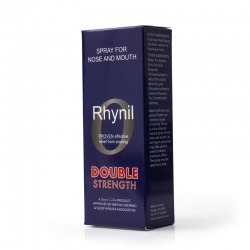 If you've tried the Original Rhynil Stop Snoring Spray and have not had any luck with beating your condition, it may be the case that Rhynil Double Strength can help reduce your nighttime noises. Providing a stronger dose than the Standard version of Rhynil, Double Strength Rhynil is more effective and has results that last even longer. Please be aware that Rhynil is not 100% guaranteed to stop snoring – the product may be ineffective due to your condition.